The U.S. Air Force’s (USAF) second new GPS III satellite, bringing higher-power, more accurate and harder-to-jam signals to the GPS constellation, has arrived in Florida for launch. On March 18, Lockheed Martin (NYSE: LMT) shipped the USAF’s second GPS III space vehicle (GPS III SV02) to Cape Canaveral for an expected July launch. Designed and built at Lockheed Martin’s GPS III Processing Facility near Denver, the satellite traveled from Buckley Air Force Base, Colorado, to the Cape on a massive Air Force C-17 aircraft. The USAF nicknamed the GPS III SV02 “Magellan” after Portuguese explorer Ferdinand Magellan. GPS III photo is courtesy of Lockheed Martin. GPS III is the most powerful and resilient GPS satellite ever placed on-orbit. Developed with an entirely new design, for U.S. and allied forces, this satellite will have three times greater accuracy and as much as eight times improved anti-jamming capabilities over the previous GPS II satellite design block, which makes up today’s GPS constellation. GPS III also will be the first GPS satellite to broadcast the new L1C civil signal. Shared by other international global navigation satellite systems, such as Galileo, the L1C signal will improve future connectivity worldwide for commercial and civilian users. The USAF began modernizing the GPS constellation with new technology and capabilities with the December 23, 2018, launch of its first GPS III satellite. 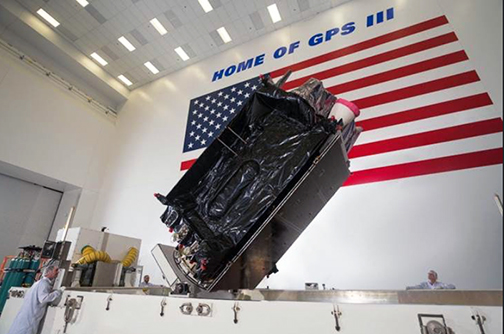 GPS III SV01 is now receiving and responding to commands from Lockheed Martin’s Launch and Checkout Center at the company’s Denver facility. GPS III SV02 is the second of ten new GPS III satellites under contract and in full production at Lockheed Martin. GPS III SV03 through 08 are now in various stages of assembly and test. The USAFe declared the second GPS III “Available for Launch” in August and, in November, called GPS III SV02 up for its 2019 launch. In September 2018, the USAF selected Lockheed Martin for the GPS III Follow On (GPS IIIF) program, an estimated $7.2 billion opportunity to build up to 22 additional GPS IIIF satellites with additional capabilities. GPS IIIF builds off Lockheed Martin’s existing modular GPS III, which was designed to evolve with new technology and changing mission needs. On September 26, the USAF awarded Lockheed Martin a $1.4 billion contract for support to start up the program and to contract the 11th and 12thGPS III satellite. Johnathon Caldwell, Lockheed Martin’s VP for Navigation Systems, said that after orbit raising and antenna deployments, the company switched on GPS III SV01’s powerful signal-generating navigation payload and, on January 8, began broadcasting signals. The on-orbit testing continues, but the navigation payload’s capabilities have exceeded expectations and the satellite is operating completely healthy.